■ Comes with simple controls and Auto Play system that supports a game on a smartphone . You can have fun with the game anywhere anytime. ■ Adventure in colorful fantasy 3D worlds. Enjoy the journey to stop the evil dragon Elga. ■ Chosen as the Dragon Hero: Warrior, Magician, and Theif the way you like. ■ Special Skill development and upgrade to a Combo attack with a variety of different weapons to choose. ■ Challenging many Missions and Quests to hunt for special Prizes, Set of super rare weapons and armors! 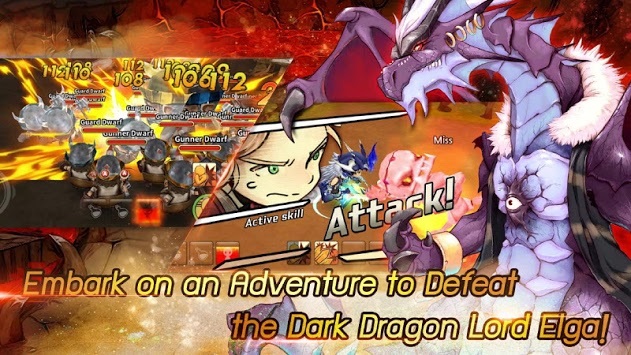 ■ Fight for glory and honor in the daily Non-Stop Battle League system to be the strongest dragon hero of the world. ■ Customize your character appearance in your own style with more than 200 Fashions item. It’s time to show-off to your friends! ■ Have your cute Pets accompany you on your adventure. Evolve them to the higher rank to get the most reliable friends for fighting your enemy. ■ Fun with your friends on the LINE! With LINE Friend List, invite your friends to play and challenge them for pvp to win a special reward.